For over a century, our machines and embossing rolls have benchmarked industries using rigid and flexible plastics, fine paper, nonwovens, metals and print-to-register packaging. 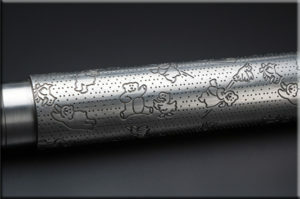 IR Engraving manufactures engraved production rolls and plates that impart uniform patterns and engineered applications to a wide spectrum of consumer products. To accommodate today’s fast paced manufacturing environment, we have developed complete digital engraving technologies for efficient use by our customers and designers. We have the versatility to quickly customize, design, and reproduce patterns ranging from fine leather grains to large geometric patterns. Rapid prototype samples are available in days or, if scheduled in advance, may be developed in real time in Sandston, Virginia. Once the baseline design is established, patterns can be easily modified for a custom appearance dependent on the needs of the application and design. Additionally, we have the industry’s leading pattern library, offering our customers over 100,000 standard designs. 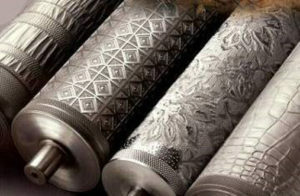 Many of these patterns have been hand cut by our leading craftsman and not easily replicated by other engraving methods. Customers are always welcome to visit our design centers to develop new generation of patterns. Capacity up to eleven (11) tons having an OAL of 372″ and 36″ diameter. Rolls up to seven (7) tons, 197″ length and 30″ diameter. Maximum width of 112″ x 326″ length x 5/8″ thick. Rolls up to 260″ length and 42″ diameter or less. Rolls up to 200″ length and 38″ diameter or less. Roll capacity weighing ten (10) tons and 180″ in length x 36″ diameter. Roll capacity up to 216″ length and 36″ diameter. Rolls up to 55″ length and 13″ diameter. Dies up to 24″ length and 8″ diameter. Rolls weighing up to 6500 lbs. and having an OAL of 160″ x 36″ diameter; vertical plating tank capable of chroming plates 326″ long x 112″ wide, single side or front & back. Rolls up to 90″ in length and 18″ in diameter. Developing a new pattern can be completed in two weeks.